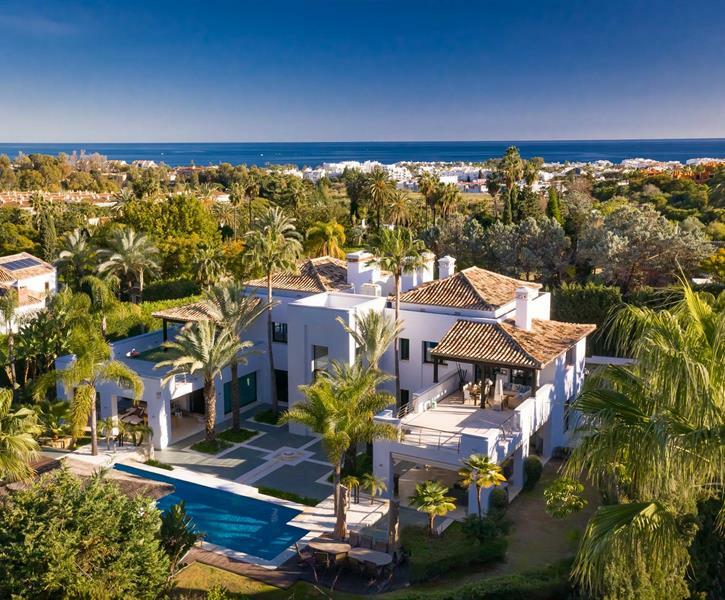 Villa Nuevo Banus is an impeccably stylish modern designer villa in Puerto Banus, a contemporary, sleek and spacious property with 7 bedrooms sleeping 14, perfect for big families. The bedroom configuration is as follows: Ground floor: 1) Master bedroom suite with King size bed, lounge area with leather sofa and Samsung flat-screen TV, bathroom with Jacuzzi bath and separate shower, plus an additional shower room and plenty of wardrobe space. Access to pool terraces. 2) Guest twin/King bedroom with en-suite shower room and executive’s desk, access to poolside terrace 3) Guest twin/King bedroom with en-suite shower room and a large private balcony 4) Guest double bedroom with en-suite shower room and large terrace Lower Ground floor: 5) Guest suite with King size bed, seating, TV and en-suite bathroom with large spa bath 6) + 7) Apartment with twin bedrooms and a shower room, can be accessed from the main villa or via a private entrance.